Butter Chicken was one of my favorite meals before going veggie and this Vegan Butter Chicken was one of the first recipes I created for this blog when I started it back in 2013. I had just moved to Belgium, was a new vegetarian and dove right into my new-found love of everything veg! Since then, I’ve changed the recipe slightly and I thought it was time for me to share the recipe with you guys (with some updated photos, lol! I’ve since learned that taking photos of leftovers is usually always not a good idea, ha!). This Vegan Butter Chicken is so incredibly creamy, comforting and full of rich flavors from the spices and thick tomato and cream sauce. Plus, it tastes out-of-this-world-amaaazzing on top of a fluffy bed of basmati rice! 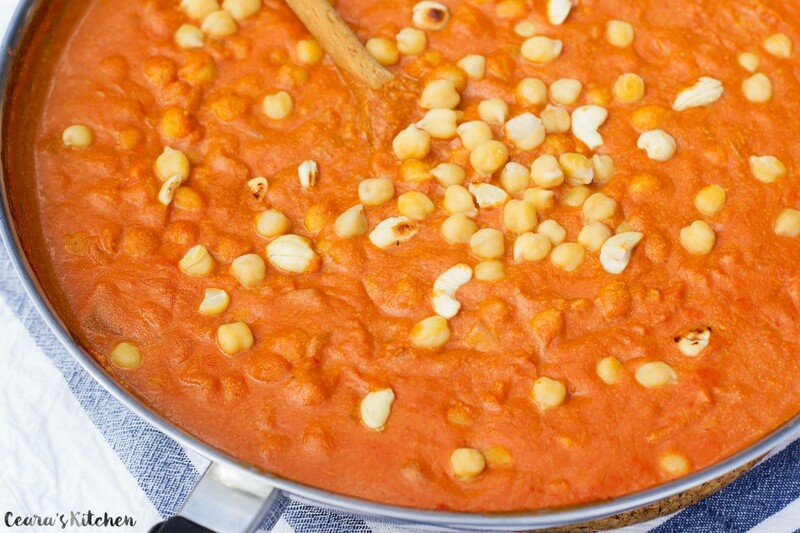 The “secrets” to this Vegan Butter Chicken lie in the cashews and the chickpeas. The blended cashews make the sauce of this Butter Chicken so incredibly buttery, rich, creamy, comforting and delicious. The cashews also do a wonderful job of thickening the sauce of this vegan butter chicken when it is simmering on the stove. The chickpeas replace the “chicken” that is traditionally used in this recipe. The chickpeas makes this Vegan Butter Chicken so incredibly hearty, slightly nutty and meaty. I love to use freshly cooked chickpeas because they are slightly firmer than the ones that come in the can. Canned chickpeas also work here if you are in a pinch. 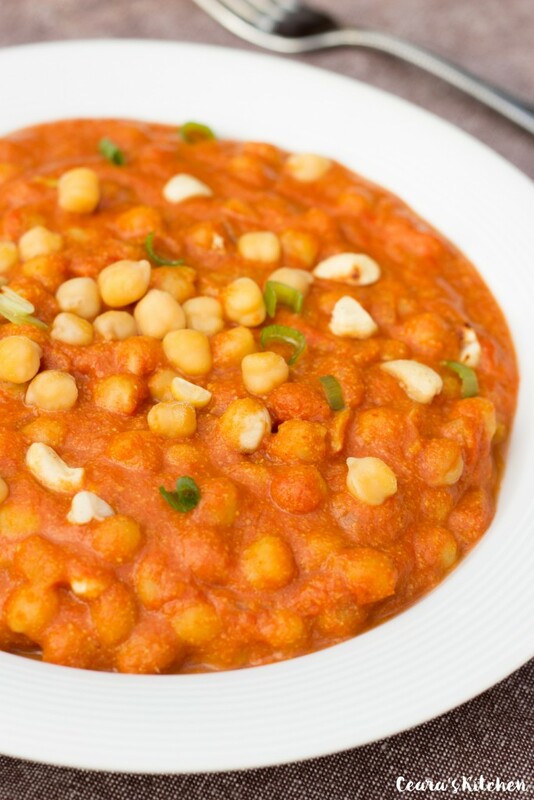 When I originally made this recipe, I used half chickpeas and half cauliflower, I still sometimes make it this way but have come prefer this Vegan Butter Chicken with only chickpeas. This Vegan Butter Chicken is one of my favorite meals to serve for dinner. It is a simple recipe to make and is ALWAYS a hit with everyone at the table. You can adjust the spiciness based on how much of a kick you like in your food (I like a lot of spice but tone it back a bit when I’m serving this to company or family). This Vegan Butter Chicken is one of my favorite meals to serve for dinner. The cashew cream makes this Butter Chicken so incredibly rich and “buttery” and the chickpeas make it so meaty and hearty! 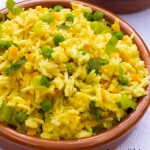 Serve over [url href=”https://www.cearaskitchen.com/indian-saffron-yellow-rice-pilaf-vegan-glutenfree/” target=”_blank”]Saffron Yellow Rice Pilaf[/url]. Soak cashews in hot water while preparing the sauce. On medium high heat, in a large pan, saute the onions and garlic with the spices (garam masala, cumin, cinammon, ginger and cayenne pepper) in 1/4 cup of the vegetable broth until the onions are soft and the spices are fragrant. Add the remaining vegetable broth (1 cup), plain tomato sauce and sugar. Simmer for 5-8 minutes or so until fragrant. 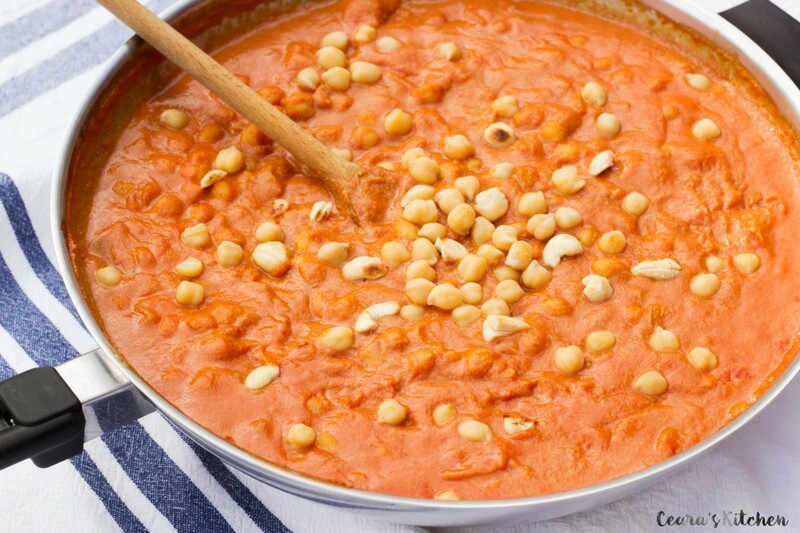 Rinse your cashews, In a blender or in a separate deep bowl, blend 1/3 cup of raw cashews with about 1/3 cup of the butter chicken sauce that is simmering on the stove until creamy and smooth . I used a stick immersion blender and blended the soaked cashews with a bit of the sauce in a deep bowl. 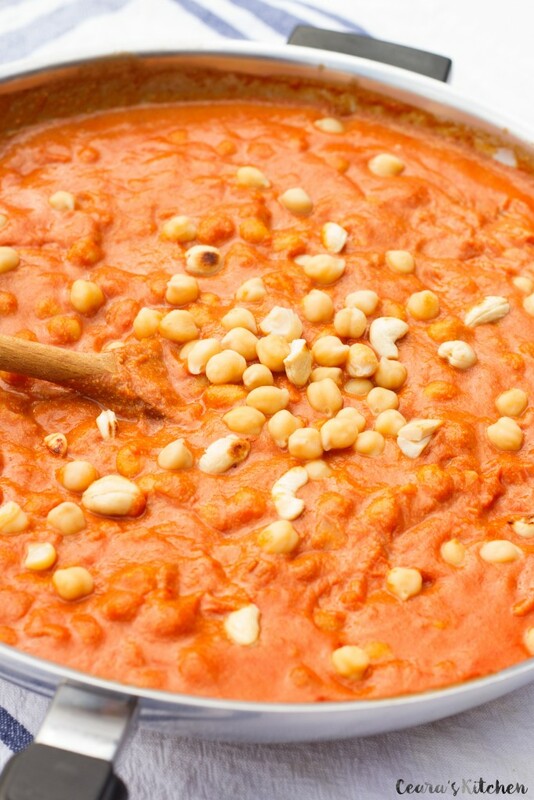 If you are using a high speed blender you may need to add in about 1/2 cup of the sauce with the cashews for it to blend well. Transfer the blended sauce back into the pan with the rest of the Butter Chicken sauce. If using, in a separate pan, over medium high heat, roast 3 tbsps of cashews for 5 minutes in a pan (these are the cashews that you will use to garnish the butter chicken with). Add the chickpeas to the pan. Simmer for an additional 5 – 10 minutes. Serve Butter Chicken over [url href=”https://www.cearaskitchen.com/indian-saffron-yellow-rice-pilaf-vegan-glutenfree/” target=”_blank”]yellow rice pilaf[/url]or basmati rice. Garnish with roasted cashews. 1) Use your sweetener of choice in this dish. I have also make it with 1 tbsp of maple syrup and also love it this way. 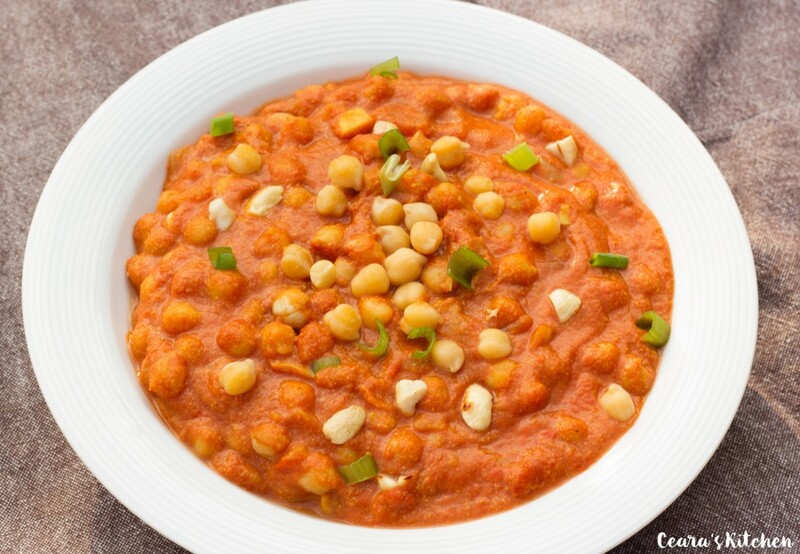 [br]2) Use freshly cooked or canned chickpeas. I like to use freshly cooked chickpeas in this recipe because they still have a bit of a “bite” to them. I recommend using way less chickpeas. Just my preference but the sauce was SOOOO amazing that constantly crunching the chickpeas ruined it for me. Best sauce recipe for butter chicken I’ve ever tried though. Absolutely perfect! I’ve been making this almost every week. Ditto to all the positive reviews of this recipe! It was outstanding! Substituted sunflower seeds for cashews and that worked great. Also followed another reviewers’ suggestion to use 1 can of chick peas and 1 small head of cauliflower. I forgot to add the cayenne pepper but it was still delicious! Thank you for another GREAT recipe!! Very good. I added lemon juice and salt which made it even better. I make this every week or so… today I added potato and mushrooms, it’s delicious and I’m not a great cook… thank you so much for the recipe! Delicious. We had it last night, and my 3 year old would only eat the sauce, kept asking for more. The only difference is that I blended everything because my kids won’t eat it if it looks like beans. Then I sauteed some cauliflower and added it in so the sauce had some texture. This was thanks to your note that you had done half and half with chickpeas and cauliflower in an earlier version. Husband had 3 helpings! I’ve made this recipe four times now and love it! This was really, really good. We are not vegan but made the recipe as-is except for chicken broth instead of veggie broth. Was really surprised at the creamy texture of the sauce! Served with some parathas, nice addition to the dinner rotation! This is an awesome recipe; one that I will come back to again and again. 5 stars. Love the cashews in the sauce for a creamy effect… that part was great. Unfortunately the whole thing is really under seasoned and just tastes like a creamy tomato sauce. I would advise folk to check other recipes for spice quantities, buy or homemake a curry paste with this. Was actually really disappointed with the end result. Did not taste like a curry! had to add loads of spices after the tomatoes were in which isn’t ideal. Although I customized things a bit to suit my individual taste (a bit less garam masala, a bit more cumin), I found the amount of spices to be in the right neighborhood. I wonder if you interpreted “¾ tsp cumin, cinnamon & ginger” to mean 3/4 tsp total. I used about 3/4- 1 tsp of each. Next time I make this I might use fresh ginger, but I will probably make it again, and it tasted like curry to me! This dish had everything going for it; cheap, easy and so delicious. Oh ya, it is super healthy too ! Everyone loved it! It is so worth the five stars! I was looking for healthy vegan meals to put on my shortlist. This just zoomed to the very top of the list. Now to look for other meals that won’t pale in comparison and will still be cheap and easy. Have you ever tried this w/vegan chicken like gardein or beyond meat? Does it work well if yes? Keen to know how you go Troy. I’m in Australia too. Just made a different version (recipe from elsewhere) of this tonight using a plain passata and it was very bland. I’m hoping that was due to the overall recipe and not the passata swap out – normallydon’t have issues doing that. I’m going to give this a try today, and as far as tomato paste/passata goes, we use an italian brand called ‘Mutti’. This is 99.5% pureed tomato, the other 0.5% is salt. Flavour is fantastic and the consistency is nice also. I do not cook so I did not know to do something to the chickpeas prior to adding them to the pan. I simmered the sauce an extra 30 minutes. So what should I do to the chickpeas prior to the last step? Next time it will be even better. Excellent recipe, Great texture, flavour was very good, but thought it was a little short on umami, definitely low on salt, I added about 2tbsp of yellow miso, terrific. Thank you, Dave! Happy you enjoyed the recipe! I’m in the uk and want to try this…is the tomato sauce you mean ketchup? Like what you dip fries in? Hi from Cyprus. This is the perfect time for me to try this dreamy dish! I wonder, do I soak the chickpeas overnight and I just boil them until cooked and then I add them in the sauce? Where about in belgium, may I ask, do you live? I moved back from belgium a year ago. I just made this dish and I am in love! Thank you for sharing such a wonderful and simple recipe! I have really missed the flavours of butter chicken since becoming vegan and this really satisfied that craving!! Off the charts incredible! Where’s the 10 star button? Thank you so much for sharing this! Avoid any room for confusion if you modify the recipe to read: “3/4 tsp EACH, cumin, cinnamon & ginger”. I have non-cooking friend who thought it was supposed to mean 1/4 tsp of each spice for a total of 3/4 tsp. made this dish this past weekend. it was phenomenal! i can’t resist any meal with that much tomatoey-goodness. delicious! thanks so much for sharing! THis looks so good, Ceara! Holy goodness! This sauce is AMAZING! I loved it so much after adding the blending cashews that I added more — more of a good thing is great! Even my picky 8 year old daughter loved it. Thank you! I’d also love to know how this freezes! I made this again yesterday, with brown basmati. I made the recipe exactly as written, except just a can of tomatoes instead of tomato sauce , and I added steamed cauliflower and spinach along with the chickpeas. It was, once again, totally excellent. I made it for a group of non-vegan friends, and they all loved it. Many thanks for sharing this delicious recipe! So happy you and your friends enjoyed the recipe, Sophie!!! 🙂 Thank you! You say you can put it over “yellow rice pilaf “. (which, by the way, is delicious)? So happy to hear you enjoyed the Butter Chicken too! Can I replace the raw cashews, veggie broth and tomato sauce with 2 tblsp whole wheat flour, a can of coconut cream and a can of tomato paste? All through making this I was thinking, I’m gonna be disappointed, this isn’t going to be like my restaurants butter chicken… But I was so delightfully surprised. It’s so strange the buttery favour that the cashews added. Thanks so much for sharing this recipe, will definitely become a staple! Cheers! ABSOLUTELY DELECTABLE! I followed the recipe exactly besides adding a few late cherry tomatoes from my garden. They added a bright burst of flavor here and there. My husband who isn’t vegan loved it as well. * I added diced chicken that I baked in the oven while cooking to his portion. The cashew puree made it very creamy. I thoroughly enjoyed this with garlic naan bread from Trader Joes. Um, yeah, this is the BEST curry I’ve ever made, and I’ve made many! I made this with tofu instead of chicpeas (I just dry-fried the tofu and chucked it in the curry afterwards). I also added frozen peas and spinach, but otherwise followed the recipe to a T. Also, I just used plain canned diced tomatoes instead of tomato sauce. It is soooo good! Thank you so much! Oh my goodness, this dish is FABULOUS! I think it’s even better the second day. Thank you so much for the recipe! Hi. I notice your recipe says Tomato Sauce. Do you mean crushed tomatoes or the Tomato sauce you put on pies etc? As in “rosella tomato sauce australia” It is in a bottle and guess it is similar to Ketchup. 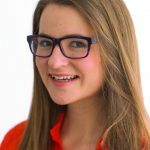 Hi Maraika! I mean plain tomato sauce that comes in jars with nothing else added to it! It’s basically just pureed tomatoes. Here’s one of the brands I like to use. So that was absolutely magnificent. I made it with passata as we don’t have that kind of tomato sauce here, so maybe I’d make it a bit sweeter next time, but it was beautiful. Hot, spicy, sweet. Looking forward to the 2 other things I found on your site I’m cooking this week now! I’ve not even finished cooking it yet, but I just tasted the sauce before the chickpeas go in. Wow! That is some tasty stuff! I made this today, I just used almonds instead of cashews since that’s what I has, and Oh My God it’s so good! Thank you so much for sharing! This was fantastic! I bought garam masala a year ago and never got the courage to use it until now. I really modified the recipe to what I had on hand, but the flavors were unlike anything I’ve ever had. Thank you! Thank you, Jess!! 🙂 Sounds absolutely delicious! Thank you for sharing!! The colour of that sauce is amazing! I used to love butter chicken, but I haven’t made it since going veggie. Interesting about the cashews too. Is that 3/4 tsp EACH of cumin, cinnamon & ginger? Or 1/4 tsp of each (adding up to 3/4 tsp)? This is so creative! I’ve never had butter chicken, but I’ll happily just skip the original altogether and dive into this healthy vegan version! It looks easy and delicious and the spice blend sounds wonderful 🙂 Definitely pinning this to try! This looks so good! 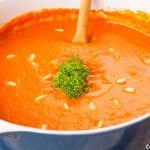 I love all the spices in here and the sauce looks so velvety and creamy! Beautiful too! I have never heard of this dish before Ceara, but I’m drooling all over my keyboard reading the ingredients, so I know it’s fantastic! I swear, every dang recipe of yours makes me hungry and I’m NOT making that up! This looks incredible and I’m dying to try this one now…I just need to get some garam masala! The color is just gorgeous and I love your closeup shots! !